Like cleanliness habits and horoscopes, the way you deal with your hair says a lot about you. This feels especially true in the summer when humidity runs rampant and every day activities result in sweat, frizz, and an urgent desire to just cut it all off. Here at the Atelier, we’re constantly chatting (see also: complaining) about how and what to do with our hair during these hot and sticky months. 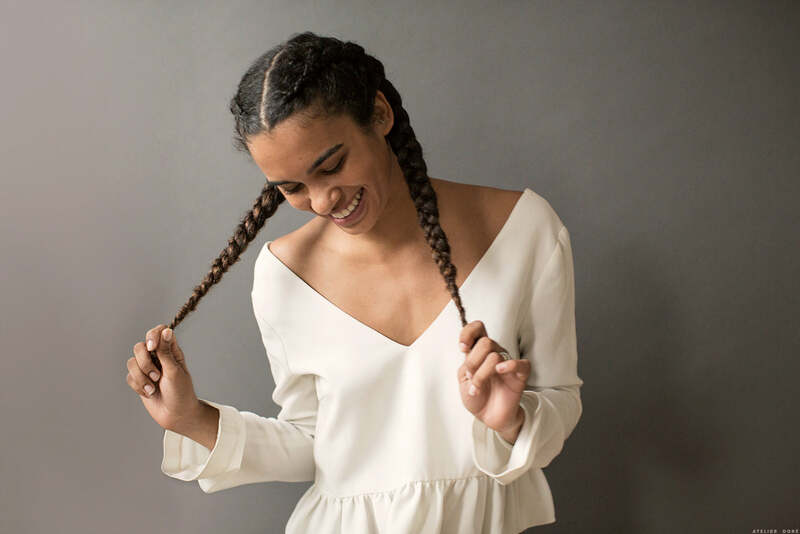 In an effort to inspire ideas and infuse positivity in the often pessimistic weather related complications, we invited three friends with three different hair types over to capture them in summer styles that feel natural and cool (in temperature and style) to them. Cheyenne Adler is our vibrant and beautiful friend who works in Brand Marketing at Squarespace. She describes her hair as being naturally frizzy but not dry. Her curls (and that smile!) are enviable, but in the summer she tries to keep the frizz down by washing and applying fresh product frequently. Most importantly, she likes to keep it out of her face by throwing it up into a ponytail or some braids. Molly Young is a writer and a creative at Warby Parker. She’s got “middle of the road” hair that she washes once a week with Hairstory and supplements with dry shampoo. When she puts her hair up in the comfort of her own home she uses a scrunchies (or sweatpants for hair – her words! ), and in public she uses a hair tie with a satin bow, because it’s an added reward with no added effort required. Our kind of girl! Chelsea Neff is a florist who has self-described flat hair, albeit blonde and beautiful! Chelsea can’t work or eat a meal with her hair down, so she turns to a sleek low bun that, with minimal accessorizing, has become her signature style. So much so, she got married in this exact hair style. Now, spill the beans. How do you deal with your hair when its presence on the back of your neck has you borderline melting? Rinsing with water only as needed…no shampoo and no conditioner. No products either, so that way your hair does not get “dirty” ( I find that products attract more dirt in the process). I brush my hair nightly and use a beautiful Japanese wooden comb (less damaging) to style and with regular rinsing my hair is actually cooperating better than with a lot of expensive products. So easy and so freeing!!! I actually have short hair that I’m in the process of growing out. It’s naturally wavy, not unlike Garance’s hair, and with the humidity I simply embrace the curls and frizz. I don’t wash it much, perhaps once a week. Other days I just use conditioner – or simply water, like Sabine. A simple rinse works great to get rid of bed-head and reshape the curl. I love putting a bit of oil in my hair after getting it wet, such as jojoba or Little Barn Apothecary’s lavender & frankincense oil. Sometimes that’s enough to smooth the frizz. If I want the curls to get more pronounced I used a bit of curling cream. The trick – style it pretty flat, let it air dry almost completely, then scrunch your hands through to bring out the curl. Ma femme a une petite boutique en ligne de vêtement femme sur Facebook. Est ce que je pourrais vous demander de lui donner un petit coup de pouce, en parlant d elle et de sa petite boutique en ligne ? Elle fait ça en complément de son travail. Mais pour elle, la mode, ç est vraiment une passion. Je vous joins son adresse Facebook. Je vous en serais vraiment très reconnaissant. J’ai tout coupé ! L’été c’est l’occasion rêvée pour tenter la coupe courte et voir l’effet sur son minois et surtout se sentir libre comme l’air et légère comme une ballerine du Bolchoï (parfaitement, j’ai fais des sauts de biche tout l’été). Where does Molly Young get her ribbons?